Recently a friend suggested that I read a book which had impacted him in a significant way. 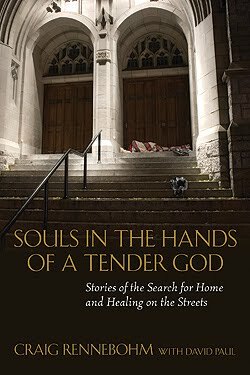 The book entitled Souls in the Hands of a Tender God chronicles the lives of a number of "souls" who struggled with mental illness, homelessness, and a variety of social struggles. The author, Craig Rennedohm, is a minister in the Seattle area who is widely recongnized for his compassionate work supporting those who have been largely disenfranchised by mainstream society. A quote in the first chapter caught my attention. "We are pilgrims. Some of us travel familiar roads throughout our lives, highways well marked; we might never leave the village or neighborhood in which we grow up. Others of us move out into new territories, different and distant lands, to follow our calling or our dreams. And some of us are taken, not of our own will or choice, into the landscapes of illness. But wherever we are on the journey, we are on holy ground. Our lives are sacred - and no less so when our brains are in disorder. God holds our souls and walks with us." I have often wondered if there was a book out there that addressed how to help the mentally ill and homeless and I never could find any that explained how to walk through the process. This book is truly helpful and is giving me a different picture of how to approach those who are suffering from mental illness and how to listen. It touched my heart, and now I know things I can do to really help family and friends who suffer. Thank you for sharing this book with us.